All our sires and dams are registered with the American Stock Dog Registry. They have been health checked and are wormed and vaccinated regularly. 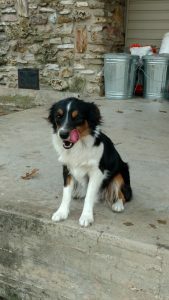 They are fed premium dog food, exercised and loved on all the time by our family. 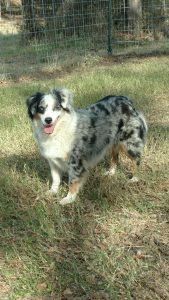 Color Country’s Daisy is a beautiful double blue-eyed blue merle. She is 12” tall and weighs about 13 lbs. She has a full collar and a good amount of copper on her. She is the alpha female of our ladies, and is so smart! 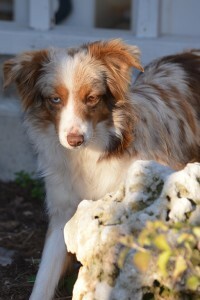 Lucky Strait’s Dakota is a lovely one blue-eyed red merle. She is 11” tall and weighs 10 lbs. 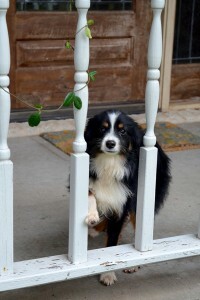 She is definitely a snuggler and has a strong herding instinct. 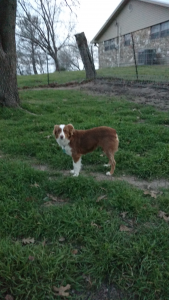 CH Tiny H Toys Annie Oakley is a red tri. She is a very sweet and loving girl, and a excellent mother. She is 11 inches tall and weighs 10 lbs. 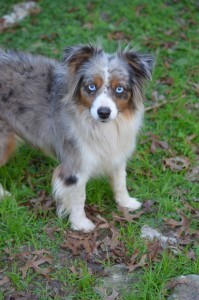 Molly is another beautiful double blue-eyed blue merle. She 13″ tall and weighs 16 lbs. Vaughan’s Josey is a black tri. She is 11″ tall and weighs 10 lbs. She is another one of our snugglers. CH Tiny H Toys Buster Strait (“Buster”) is a super-smart and handsome black tri male. He is 11” tall and weighs 12 lbs. He is so incredibly smart and so attentive. He throws blue eyes and smaller puppies.